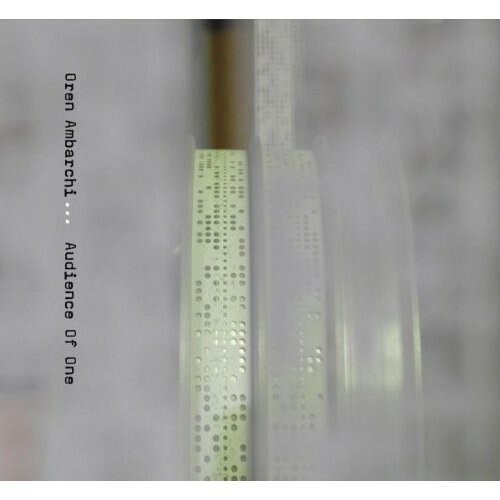 It's hard to keep up with Australian guitarist and sound artist Oren Ambarchi, not only because of the quantity of his recorded output (yesterday I listened to three LPs he's on that had piled up by my turntable this year), but also because he seems to reinvent himself at every turn—changing instruments, contexts, groups, and vocabularies. He's a member of thunderous drone merchants Sunn O))), and he's collaborated with the likes of Jim O'Rourke, Keiji Haino, Keith Rowe, Günter Müller, Z'ev, Lasse Marhaug, and Ester Brinkmann. But in some ways he's incredibly consistent, investing fully in the microscopic exploration of sound. His most recent studio album, Audience of One (Touch), conceived of as a four-part suite, opens with a bona fide song, with dolorous guest vocals from Paul Duncan of New York duo Warm Ghost; you can listen to that piece, "Salt," below. This isn't entirely surprising, since Ambarchi's duo with fellow Aussie Chris Townend, Sun, explores jangly songcraft (in that setting Ambarchi plays drums). But the epic second piece, "Knots," occupies more familiar terrain—it's 30-plus minutes of resonant droning, with haunting strings and horns meticulously arranged by fellow meta-musician Eyvind Kang. Furious guitar lacerations surge over swinging drum patterns played by Joe Talia, then recede into rising-and-falling string harmonies and more guitar noises, this time sounding like an amplified live wire thrashing on the ground. "Passage" dials down the volume and tension: it's a gentle fabric of single-note guitar flickers, wordless vocals from Jessika Kenney, and subtle frictive noises from Canadian sound artist Crys Cole. It bleeds directly into the triumphant closing piece, "Fractured Mirror"—a cover of an Ace Frehley song that features a melange of acoustic guitar, electronic bossa nova beats, swells of electric guitar, and various amorphous textures. Ambarchi's music requires a degree of submission on the part of the listener, because he doesn't serve it in the most easily digestible forms (with the occasional exception such as "Salt"). But whether the sounds are violent or calm, his total engagement makes them absorbing and meditative.